TOM BARRASSO admitted there were no positives about his Sheffield Steelers team after seeing them slip to what he labelled an “embarrassing” double loss against Elite League rivals Dundee Stars. Going into the weekend the Steelers were in the eighth and final play-off spot. Coming out of the two games which saw the Stars follow up a 6-3 win in Sheffield on Saturday with a 6-1 triumph on home ice, the Steelers sit second-bottom, two points adrift of their Scottish rivals who now occupy that crucial final post-season slot. 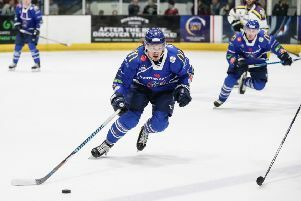 Speaking after the heavy Sunday night loss in Tayside, which saw his team never recover from going 4-0 down inside the first half hour, Barrasso said he was determined bring an end to a worrying run of form which has seen the Steelers lost five straight. “Mostly embarrassment,” replied Barrasso when asked for his thoughts on the whole weekend. “I didn’t think we played particularly well either night against a team behind us in the standings . “We let a very good opportunity slip by and I’m not very happy with my team at the moment. I think we looked at this weekend and next weekend (double-header against bottom club Milton Keynes) as opportunities, playing two teams that were behind us in the standings. Barrasso accepted his part in the malaise currently afflicting his team. “There are no positives in our game,” added Barrasso. “From myself preparing the team, obviously, to our goaltending to our defence to our forwards. We were just poor all around and we need to get back to work this week. “Hard work is what is needed. Unfortunately, that is the hard answer - if it was easy everybody would do it - that’s what makes playing this game so great, if you’re willing to put in the work and do the hard things on a constant basis you can compete, but we didn’t compete very hard these last two games. HAPPY DAYS: Dundee Stars coach Omar Pacha waited 30 games before recording a victory over Sheffield Steelers as a coach - then recorded two in two nights. ''Picture courtesy of Derek Black/EIHL. I didn’t think we played particularly well either night against a team behind us in the standings. We let a very good opportunity slip by and I’m not very happy with my team at the moment.